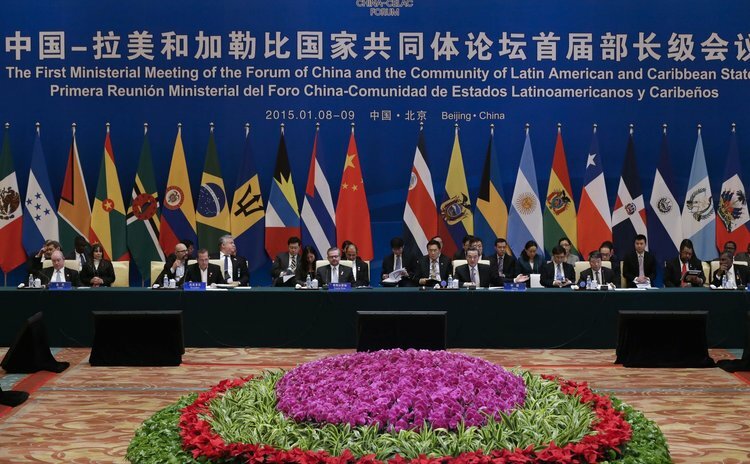 China and the Community of Latin American and Caribbean States effectively bridged their geographic distance by laying out a road map for future cooperation at a landmark meeting held Jan 8 and 9 in Beijing. The first ministerial meeting of the China-CELAC forum which coincided with visits to China by leaders of several Latin American nations, yielded three key documents to lead both sides already burgeoning cooperation and a raft of bilateral agreements. The documents are a cooperation plan through 2019 on trade, investment, finance, infrastructure, energy, industry, agriculture and other areas. It also includes the regulations for the forum and the Beijing Declaration that set a direction for the forum and defined cooperation guidelines. Trade and investment targets were also included in a renewed pledge by President Xi Jinping on Jan 8 to boost China's economic support to Latin America. China's investments in the region will reach $250 billion in the next decade and two-way trade will almost double to $500 billion during the same period, Xi said at the opening ceremony of the forum. Observers said the forum lifts both sides 'cooperation to a higher and more integrated level, which could help recession-clouded Latin America upgrade the region's economy and nurture market for China's increasing outbound business. The two-day forum marked the first time China has hosted the 33-member body, which comprises all countries in the Americas except the United States and Canada. Around 20 foreign ministers from CELAC member states attended the forum, and leaders from Costa Rica, Ecuador, Bahamas and Venezuela were present at the opening ceremony. Wang Zhen, former Chinese ambassador to Venezuela, said the opening of the forum came less than half a year after it was established in July 2014, showing both sides 'determination to guarantee the expansion of cooperation. Xi emphasized the potential for future growth in ties between China and Latin America, whose combined population accounts for one-third of the world's total. China's economy will continue medium to high speed growth in the coming years and will provide more opportunities for the world, including Latin American and Caribbean states, he said at the opening ceremony. "Expanding cooperation discussions at this forum will determine deepening integration with Latin America in the next five years in fields including security, trade, finance, technology, energy, resources, industry and agriculture," Xi added. Trade between China and the region has grown from $10 billion in 2000 to $257 billion in 2013, driven largely by Chinese demand for commodities such as crude oil and agricultural products. In return, China has pumped billions of dollars in investments into the region. When Xi visited Latin America in July, 2014, China extended a $20 billion loan to the region for infrastructure development, another $10 billion in preferential loans, a $5 billion fund for cooperation and $50 million for agricultural development. This funding has already worked, or is about to, said Xi, sending good news amid economic headwinds buffeting some Latin American nations due to plunging oil prices that hit five-and-a-half-year lows. Sun Yanfeng, a Latin American studies researcher at the China Institutes of Contemporary International Relations, said both sides'economies remain complementary, despite difficulties facing some Latin American nations, and slowing growth in China. Besides traditional trade, especially in commodities, China has been placing more emphasis on extending investment and financing to sectors like infrastructure and technology, Sun said. Premier Li Keqiang said on Jan 9 that China has the advantage of capacity in areas including infrastructure and equipment manufacturing and it is ready to cooperate with Latin American countries in these areas. Li, when meeting with delegates of the forum, called on Latin American countries to provide a fair competition environment and impartial legal protection for Chinese goods such as equipment entering local markets. In cooperation with developing countries, China would consider their need for self-development, "instead of simply trade and investment or mere one-off sales of resources and energy", Foreign Minister Wang Yi said on Jan 9. Wang is confident the economic cooperation goals will be realized, saying this will help some Latin American countries to restructure oil-reliant economies and nurture markets for outbound business from China. Speaking of Venezuela, whose economy is obviously reeling from tumbling oil prices, Xi voiced China's support to the country's efforts in restructuring its economy and emphasis on manufacturing. Both countries should take better advantage of the China-Venezuela High-Level Mixed Committee and financing systems, allowing funds to target energy, mining, agriculture and industry sectors, Xi said when meeting Venezuela's President Nicolas Maduro on Jan 7. The committee is a key mechanism for both governments to engage in cooperation, including the oil-for-loan agreements under which oil and fuel shipments have been used to repay debts. China is Venezuela's second-largest trading partner and oil customer, and has already agreed to billions of dollars in loans for Venezuela. Shortly before the forum, China also upgraded ties and signed a raft of agreements with Costa Rica and Ecuador after Xi's separate meetings with Costa Rican President Luis Guillermo Solis and Ecuadorian President Rafael Correa. Costa Rica currently holds the CELAC rotating chairmanship, and Ecuador will be the next. The forum's ministerial meeting was not only a positive signal on the future of both sides, but also a step of "world reorganization", said Fernando Reyes, Chile's former ambassador to China. The forum will create a new atmosphere for strategic political dialogue in which both sides could push for the implementation of concrete plans and provide opportunities, Xinhua quoted Reyes as saying. But officials and observers also stressed the inclusiveness of the forum between China and the CELAC, located in what has been long considered the traditional backyard of the US. Costa Rican foreign minister Manuel Gonzalez, who co-chaired the forum with Wang, his Chinese counterpart, said he saw no conflict between the US longstanding ties with Latin America and China's growing presence in the region. "We are talking about a world not as black or white or right or wrong. We should have abandoned such a mindset long ago," Gonzalez said at a news conference marking the end of the forum. Sun, the expert, said China does not aim to assert influence, and it is seeking a mutually beneficial cooperation and joint efforts with the region for the interests of developing countries. Maduro on Jan 8 called the forum a historic occasion and hailed both sides close ties. "To repeat what (former) President Hugo Chavez said, China is demonstrating to the world that a country does not necessarily seek hegemony as it grows stronger," Maduro said at the opening ceremony.